A 16th Century alphabet based on an original woodblock print. Letterpress printed brown ink on 300gsm, 100% cotton paper. The prints are available to purchase directly from Pressedface.com. 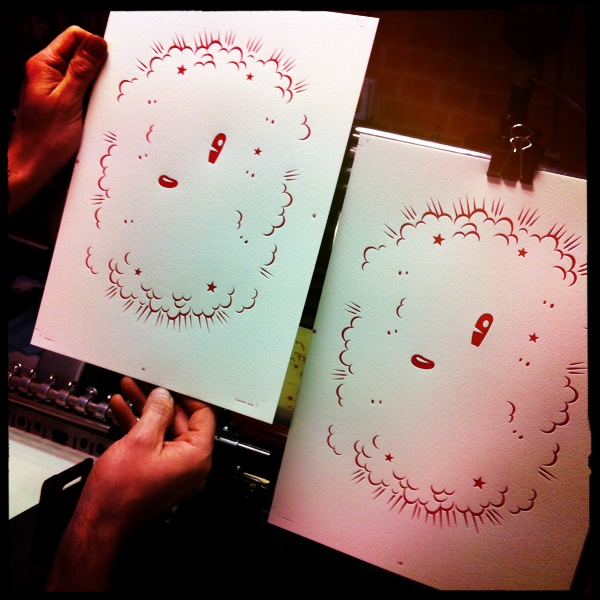 A4 limited edition prints for Paul Head at Network. Letterpress printed 2 colours on Saunders 425gsm cotton. 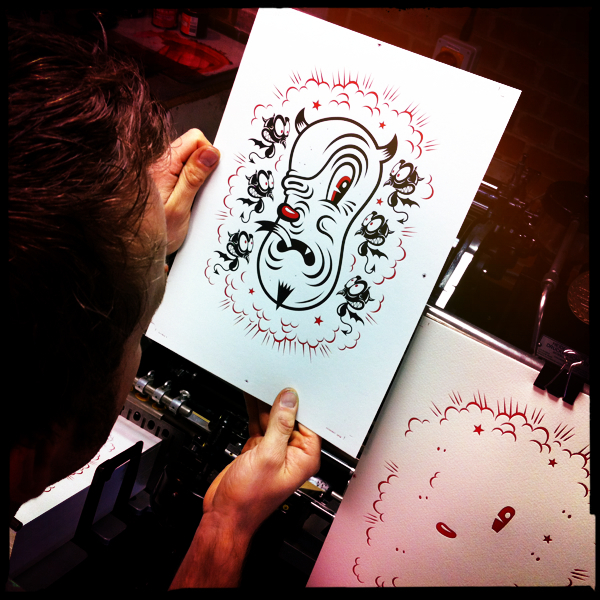 We have collaborated with Ammo Magazine and illustrator Nick Deakin to produce this limited edition letterpress print. Nick’s bold line work makes a wonderful impression into Saunders 425gsm cotton, chosen for it’s weight and texture. 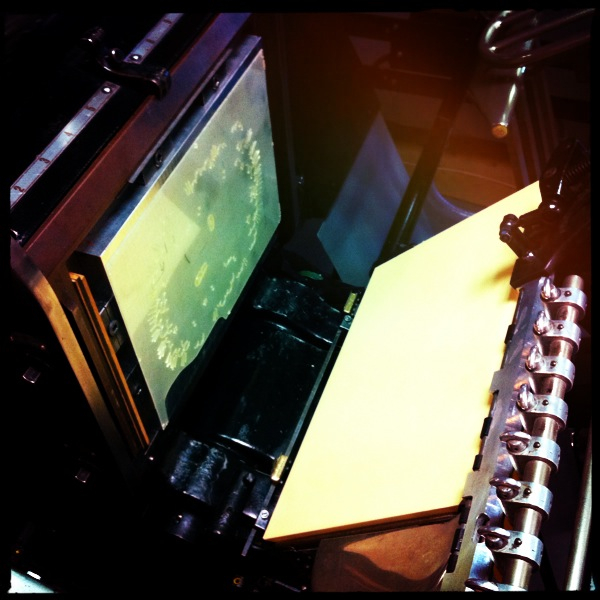 We converted Nick’s digital artwork to colour separations, outputted to film and made our photopolymer plates. The smallest detail in the illustration is transferred faithfully to the plates which are mounted on aluminum bases to type height and locked up in the chase. We printed each plate/colour simultaneously on 2 Heidelberg platens achieving accurate registration. Nick supplied Pantone colour refs and the inks were hand mixed to match. 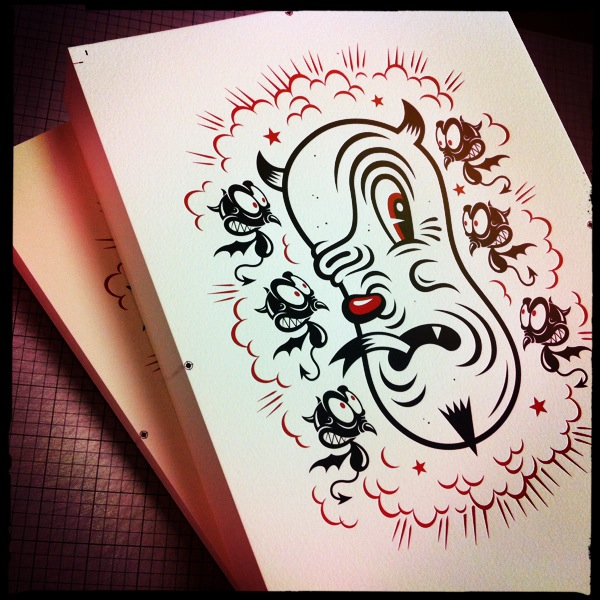 The A5, 2 colour print is signed by the artist and comes with latest lumberjack themed magazine. The print is limited to 500 so be quick! To celebrate the 2012 Olympics Found and Charlotte Trounce collaborated to create this Olympic themed limited edition calender. We letterpress printed the A3 calender on our Heidelberg cylinder press onto 300gsm Somerset cotton paper in 2 colours. The hand drawn illustrations and typography transfer faithfully to letterpress. The prints are available to buy on the Found online store. The first in the ‘Assorted Types’ series of letterpress prints showcasing classic typefaces. Designed by Jim Williams, an award winning typographer & graphic designer who has a lifelong passion for the craft of typography and letterforms. He also has a keen interest and understanding of letterpress and teaches typography at Staffordshire University. Jim’s knowledge of typography and attention to detail is second to none. Constantly ‘tweaking’ his work until it is just perfect, kerning here, letterspacing there, a real perfectionist. Limited to 100 prints and individually numbered and are available to purchase from our online store. Follow Assorted Types on Twitter for updates, special offers and exclusive previews during the production of the next prints. We were thrilled when Candykiller aka Brian Taylor called on Blush to produce his latest ‘Beast’ print. 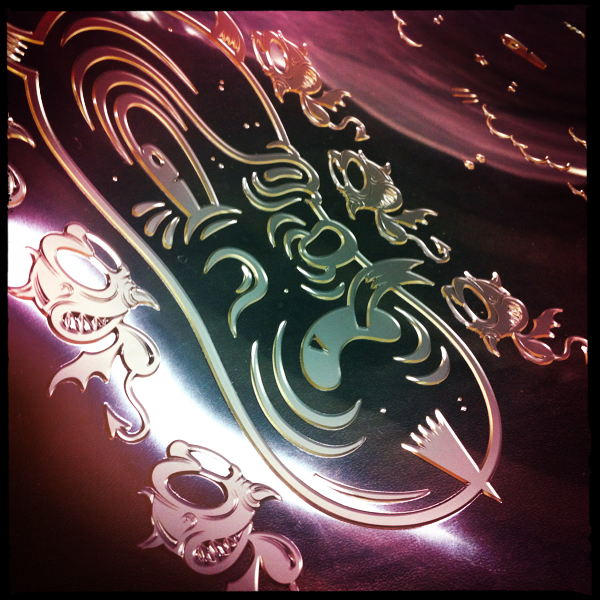 We have worked with Candykiller before, printing the 5th Anniversary limited edition prints. Candykiller’s illustrations print beautifully on the press and Brian’s attention to detail and technical ability when it comes to artwork is first class. We printed the Beast on 300gsm cotton paper on a Heidelberg platen press, tweeting live at each stage of the production, from platemaking to trimming. The first stage of the job was to prepare Brian’s artwork for print. The artwork was supplied digitally and we check the file before creating the separations. 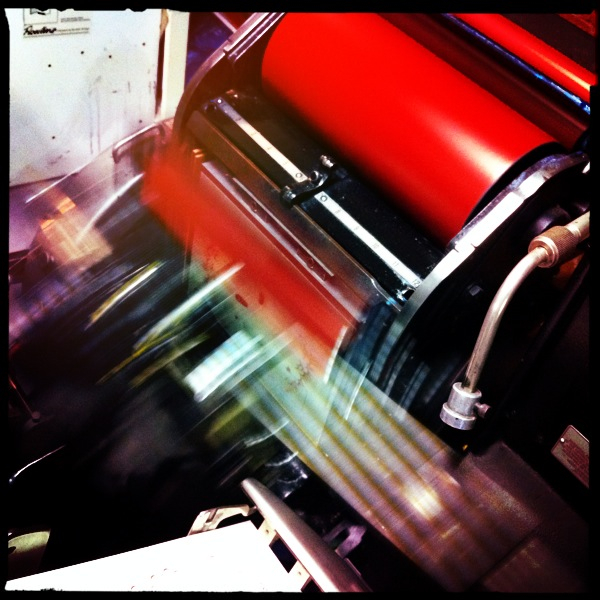 Each colour is a separate pass through the press, so once through for the red and through again for the black. This means we would need two plates. 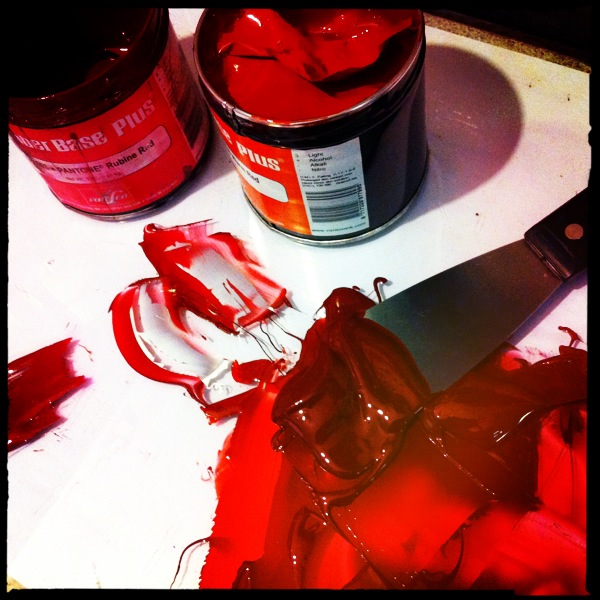 We mix the ink to a Pantone ref supplied by the artist and ink up the press. We decided to add the rider roller to give an even and consistent spread of ink across the image and to prevent ‘ghosting’. The plate is attached to a base to bring it up to type height (.918″) and locked up in the chase then locked into the press. We ink up the press and pull some initial prints to check for registration, ink coverage and impression. We also check the print for any defects in the plate. Once we are happy with we run the sheets through the press. After the first colour run we wash-up the press and prepare for the second colour. Change plates, ink up for black pass and reload the paper on the press. 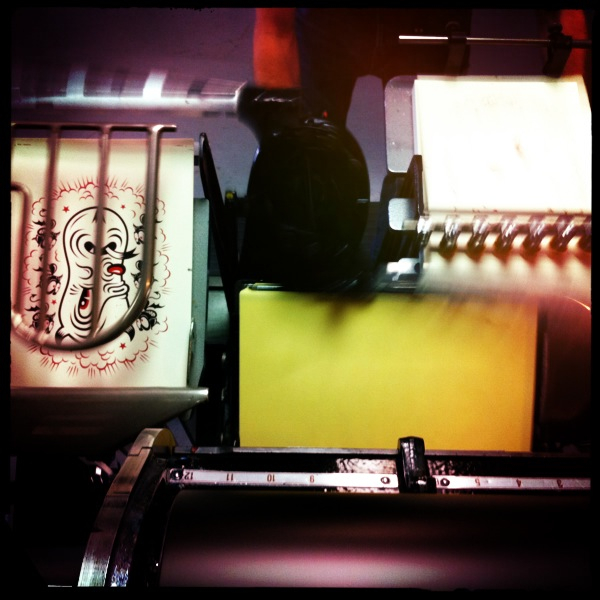 We pull some prints and check once again for impression, ink coverage and registration. 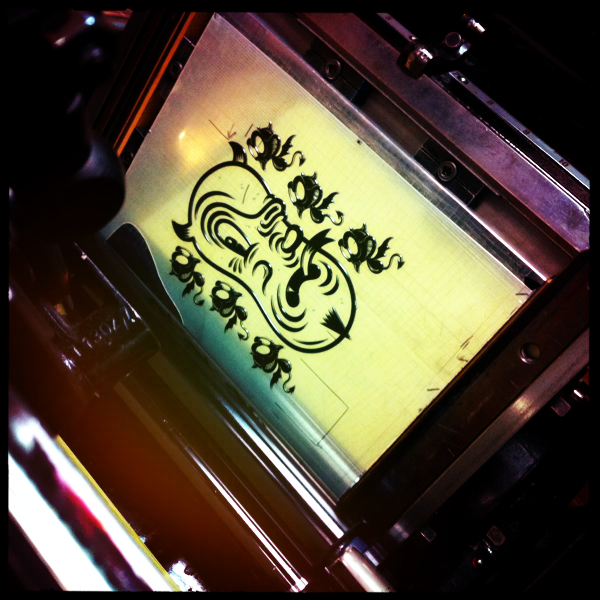 Then run the sheets through and print the black plate. The final prints are checked and trimmed on the guillotine before packing. You can see more production shots on our Flickr pages and follow us on Twitter for news and updates on future live letterpress tweets. The prints are available to purchase from the Candykiller online store. We have been having a shift around in the print room and have found some bits and pieces we had forgotten about. Amongst some posters we found a print we had taken to proof a font of wood type we had acquired. Letterpress printed on our Vandercook proofing press. The poster is 320 x 420mm light grey paper. Printed in black ink with beautiful wood type. The type is in good condition but has a few knocks which adds character. We will be giving away a copy of the print to one of our Twitter followers today. Simply follow us and say ‘Hi!” and at the end of the day we’ll pick a random winner from our Twitter followers. This TwitterTreat has now closed and was won by @PaulAdamDavis. Gill McColl of Take the Proverbial came to blush°° to letterpress print these two quotes. The hand drawn typography transferred faithfully from digital artwork to photopolymer plate to tactile letterpress print. We printed the posters on our Heidelberg KSBA cylinder. The impression strength of the cylinder ensured a consistent and deep print evenly into the cotton paper across the whole print area. The prints were printed on 300gsm Somerset 100% cotton paper. Spot colours were provided for each A4 print. Illustrator Gemma Correll came to us to print a limited edition run of her highly detailed ampersand illustration. Letterpress printed on our Heidelberg presses in 2 colours onto 300gsm Somerset 100% cotton paper. The prints are in a limited edition of 250, signed and numbered and available to purchase directly from Gemma. To mark England’s first game in this years World Cup we printed the greatest score in english football history. Hand set antique wood and metal type and printed on our Vandercook proofing press in black, red and blue. The old wood type creates a beautiful deep impression into the soft pure cotton paper. The prints are £15 each with free delivery and are available to buy from our online shop. Only a limited run.